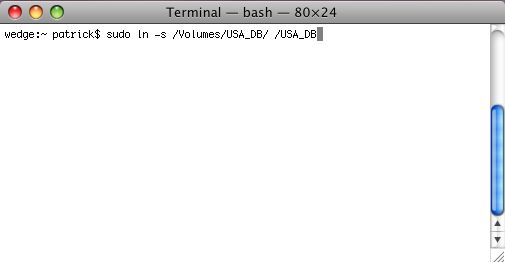 The following procedure demonstrates how to mount the /USADATA and the /USA_DB server directories, on a Mac OS X X 10.6 or 10.7 workstation, as NSF Shared points. This only applies if you already have a /USA_DB and a /USADATA local directory. Before starting, you must rename these directories if you want to keep their contents. 1. From the Finder go to Application > Utilities and double-click Terminal. 1. In the Finder go to Application > Utilities and double-click on Disk Utility. 2. 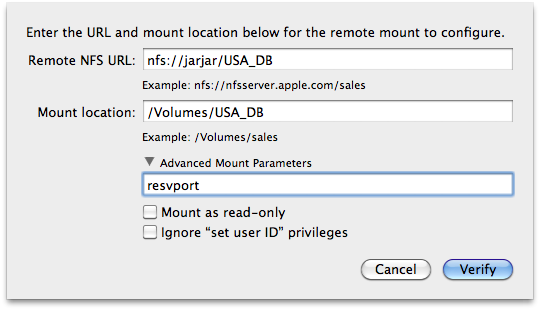 In Disk Utility, click on File > NFS Mounts. The NFS Mounts window opens. 3. Press the [+] button in the toolbar below the panel. Replace [server name] by the name of the server. For example, if the server name was jarjar, you would type: nfs://jarjar/USA_DB. 7. Click on the Verify button. 8. Click on the OK button on the message that confirms that NFS server is functional. 10. Press the Save button and enter your user password to confirm the changes. Note that on Mac OS X 10.7 there is no save button. Changes are automatically saved and applied when the NFS Mounts window is closed. 11. Quit the Disk Utility. 12. Open a new Terminal window.